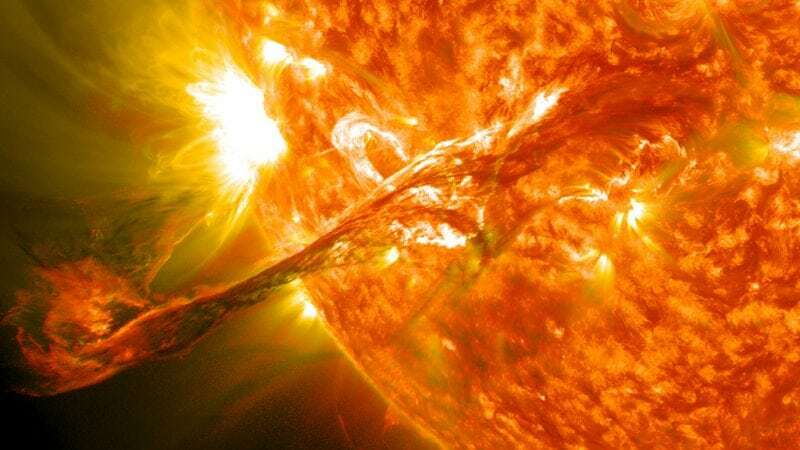 The two biggest energy explosions in our Solar System are solar flares and coronal mass ejections (CMEs). These eruptions can have a serious effect on our modern society’s way of life. A main disparity between the enormous eruptions is the scale on which they appear. A flare is a localized sudden brief brightening on the Sun. The CME is an absolutely massive eruption in terms of its developed size and can grow bigger than even the Sun itself. The source of these two major eruptions is powered by the energy stored in strongly-twisted and sheared magnetically-complex active regions (ARs) in the Sun. The wide range of electromagnetic spectrum and accelerated, highly-energetic particles are spread during the flare processes and can reach the Earth in about few hours, often causing telecommunication disruptions. Although the propagation speed of a flare is much faster than that of a CME, a CME can cause more damage than the flare itself. The Earth-directed CMEs can reach us in about 18 to 36 hours and are capable of causing very strong geomagnetic storms, which may occasionally have a major impact on our power grids and pipelines. This is not just fiction since a few very strong magnetic storms have already been known to black-out entire regions (e.g., Quebec, Canada, was catastrophically affected on March 10, 1989). Based on the past events of flare and CME interactions with our planet, one of the burning questions of current solar research is how to produce and optimize a reliable flare and CME forecast. Answering this question inspires us to develop better and more accurate flare and CME forecast methods. The two powerful eruptions often follow each other within few minutes, but there are exceptional cases where they occur separately. Our aim is to understand why. Unfortunately, we do not know the perfect answer to this burning question yet. However, we can and have developed a method that could predict which type of these solar eruptions could be expected. During our research, we analyzed the pre-flare behavior of the ARs with our newly-defined proxy in order to find indicative precursors of imminence for newly solar eruptive behavior two to three days prior to an actual flare and CME onset. Our proxy, called the weighted horizontal magnetic field gradient (WGM), is defined between two opposite magnetic polarities present in ARs. The WGM method gives fascinating diagnostic information about the expected flare energy and expected onset time. But, as mentioned above, is our goal is to predict which flares are accompanied by a huge CME and which are not. Therefore, it is intuitive to investigate the flare-CME hosted ARs and ARs with only flare eruptions separately. To explore this mystery, we followed the evolution of the movements of area-weighted barycenters of the opposite polarity magnetic fields in a coordinate system fixed to the solar surface. We have successfully identified special structures of the behavior of the two opposite polarities before solar eruptions. We have found that where there is a CME with a flare, the area-weighted barycenter of one polarity changes the location before the eruption, but the area-weighted barycentre of the second polarity stayed at the same coordinates. This empirical relation means that the strongly-stressed flux ropes tear themselves away and uplift from the Sun. On the other hand, when the AR produced flares but no CME, then the two opposite polarity barycenters changed their loci very quickly. Here, the flux ropes would relax themselves via unwinding motions. In summary, this new and simple observational tool may greatly enhance the capability of flare and CME forecast, including the accuracy of onset prognosis and predicting whether a flare will be accompanied by a CME. The next step is that we would like to considerably improve our flare and CME forecasting capability and iron out uncertainties present in the reliability of previously identified flare- and CME-risk signatures. These findings are described in the article entitled An application of the weighted horizontal magnetic gradient to solar compact and eruptive events, recently published in the journal Advances in Space Research. This work was conducted by M. B. Korsós, Michael S. Ruderman, and R. Erdélyi from the University of Sheffield, the Hungarian Academy of Sciences, and Eötvös Loránd University. Marianna is a research scientist at the Hungarian Academy of Sciences.